Statistics are all around us in the "real" world. There are a few ways to create a spinner, some more complex than the others. I choose this way to create a spinner because I want students to practice following instructions. This is a task where they are going to need to follow the instructions closely or the data will be off. The items you will need for each student are two index cards, a circle to trace that fits on the index card - I used the 1 whole from my fraction circle sets, a 1 cm piece of a straw, a paper clip and a piece of tape around 2 inches long. The straw is between the circle (spinner) and the base to help it turn. Don't forget to have your students draw a line from one corner to the center of the base card - this is the pointer for the spinner. I specifically choose to have my students divide the spinner into 1/2, 1/4 and 2 1/8's to link to the benchmark fractions. An easier way to make a spinner is to have your students trace a circle on a piece of paper, fill in the sections and then put their pencil point in the center of the spinner with a paper clip as the spinner. Once the spinners are made it is time to start the mathematical exploration into probability. I ask my students a few questions before we begin. Is there a color that is more likely to come up than any other number? Answers typically are, "Red will come up the most because it is the biggest or takes up the most space on the spinner." 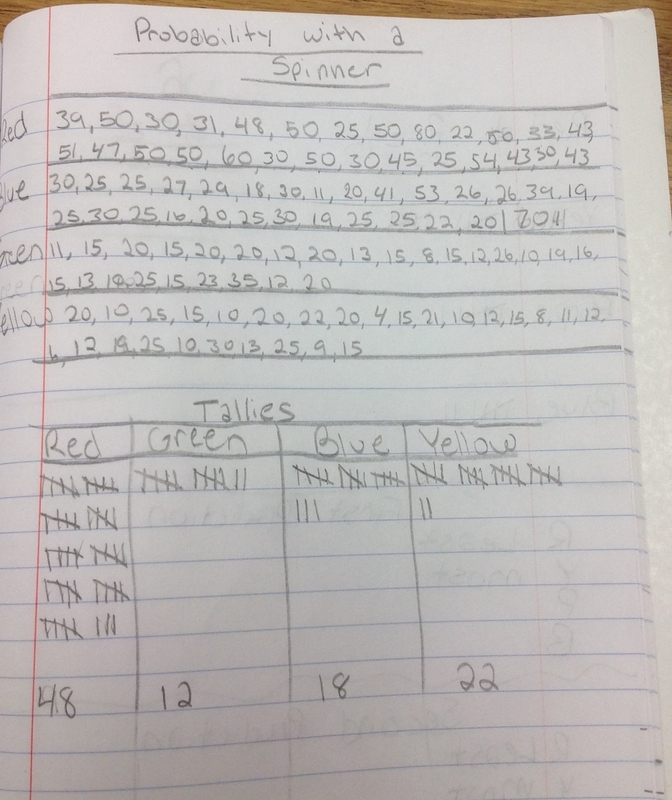 Make a prediction of how many times the spinner will land on red, blue, yellow or green and tell me why in your journal. I do not have my students share out their answers to this question because I know there will be wrong answers and I want them to only hear the correct answer. The main purpose of this lesson is probability and the fractions/percents provide an opportunity for review. This turns into a mini assessment of what students know about fractions and percents. I take note of student predictions as I walk around the room, and at a later time return to the students who had incorrect answers. Then lead a discussion on how the fractional units represented by the colors on the spinner face - red is ½ or 50%, the blue is ¼ or 25% and the yellow and green are 1/8 or 12.5%. As students listen to each other, I remind my students they can then revise their answers if they were not correct. In the next lesson section, the student in the video struggles with to come up with the 1/8 fraction, and I give him the answer. Later, when working with him, I ask him to explain to me why the green and yellow are 1/8 of the circle. To once again tie this lesson into a review of fractions and percents, I ask students to help me label the fractional parts and percentages of the circle. You can see this on the picture. Have students spin 100 times, recording the data on a chart. You can see an example in the student work below. The top of the page is the class totals for each spin. Once the students finish tallying their spins, I collect the data on the whiteboard. Have your students also write the class totals in their math journals while you are recording them. You can see the totals in the picture. To help students organize their thinking, I ask them to look for anything they notice between the colors represented on the spinner and the classroom data set. I give them a couple of minutes to talk at their tables, first constructing viable arguments for why one color has more tallies than another and then they list to one another, and critique (in an appropriate manner) the reasoning of others (MP3). This isn't the end. If I don't hold my students accountable to dig more deeply into their thinking, it's not going to be a habit they develop. So I ask my students to look at the reasonableness of the data. They point out the total number of spins equals 2,697, and it should have been 2,700 times because we have 27 students and each spins 100 times. They decide the mistake was in the green or yellow tallies. I knew they were right because I had skipped collection of data from a student who I knew had made made a mistake and didn't want to give a wrong answer. We also look for outliers in the data, and a few students continue on during finish up time to figure out the mean, median, mode, and range of each color as well as a line plot graph for each color.